On January 30, 2015, we had a question-and-answer call with the late legendary psychologist, Walter Mischel, PhD, Niven Professor of Humane Letters, Professor of Psychology, Columbia University, internationally known for his groundbreaking research on delayed gratification, and author of a new book, The Marshmallow Test: Mastering Self Control. An inspiring man, he died on September 12, 2018 at the age of 88. You’ll also receive a complimentary subscription to our monthly email newsletter, The eMentorCoach News. You can unsubscribe at any time. In the late nineteen-sixties, a four-year-old girl was invited into a “Surprise Room” (actually a large closet with only a desk and chair) at the Bing Nursery School, established as a “working laboratory” on the campus of Stanford University. She was asked to sit down and pick a treat from a tray of marshmallows, cookies, and pretzel sticks–she chose the marshmallow. A researcher then gave her a choice: she could either eat one marshmallow right away or, if she was willing to wait while he stepped out for a few minutes, she could have two marshmallows when he returned. He said that if she rang a bell on the desk while he was away he would come running back, and she could eat one marshmallow but would forfeit the opportunity to have the second. Then he left the room. 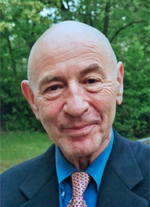 Walter Mischel had refined the protocol for the now famous Marshmallow Test by varying treats, conditions, and strategies at his kitchen table with his three preschool daughters, ages 3, 4, and 5–having noted this was a developmental period with significant learning about delaying gratification. After several months, he was able to introduce his research protocol at their school, the “Bing,” a setting already oriented to experimental work, with one-way observation windows and ongoing research projects. For years, he collected hard data and observations on how children responded to the test, dividing them into “high delayers” and “low delayers.” He was fascinated not only by how long these children delayed, but what strategies they used in responding to the temptation. Footage of these experiments, filmed over years of research, reveal myriad coping strategies the 550 children included in these studies used as they tried to delay gratification: Some sang, talked aloud, or covered their eyes or turned around so that they couldn’t see the tray. Others started kicking the desk, or tugged on their hair, or stroked the marshmallow as if it were a tiny stuffed animal. One boy looked carefully around the room to make sure that nobody could see him, and then picked up an Oreo, delicately twisted it apart, and licked off the white cream filling before returning the cookie to the tray–with a satisfied look on his face. Most of the children struggled to resist the treat and held out for an average of less than three minutes. “A few kids ate the marshmallow right away,” Mischel remembers. “They didn’t even bother ringing the bell. Other kids would stare directly at the marshmallow and then ring the bell thirty seconds later.” About thirty per cent of the children, however, successfully delayed gratification until the researcher returned, some fifteen minutes later. These kids had wrestled with temptation, but found a way to resist. The initial goal of these experiments was to identify mental processes that allowed some people to delay gratification while others simply surrendered. After publishing a few papers on the Bing studies in the early seventies, Mischel moved on to other areas of personality research: “There are only so many things you can do with kids trying not to eat marshmallows,” he said. Over the ensuing years, however, Mischel occasionally asked his three daughters (all of whom attended Bing) about how their childhood friends were faring. Through this idle dinnertime conversation, Mischel began to notice links between their friends’ academic performance as teen-agers and their ability to wait for the second marshmallow. He asked his daughters to make ratings about their friends’ academic performance, and when he compared these with his original Bing data set, correlations emerged. “That’s when I realized I had to do this seriously,” he says. So in 1981, Mischel initiated follow up with all the reachable parents, teachers, and academic advisers of the six hundred and fifty-three Bing subjects (by then high-school students) who had participated in the marshmallow task. His questionnaire asked for S.A.T. scores and ratings on a wide range of traits, from their capacity to plan and think ahead to their ability to “cope well with problems” and get along with their peers. Once Mischel began analyzing the results, he noticed that low delayers, the children who rang the bell quickly, had lower S.A.T. scores (by a significant 210 points!) and were more likely to have behavioral problems in school and at home. They had more attention problems, struggled in stressful situations, and found it difficult to maintain friendships. Results on the simple Marshmallow Test showed impressive predictive ability. Mischel and his colleagues have continued to track the subjects each decade into their adulthood. They found that the children who were able to delay gratification had higher SAT scores entering college, higher grade-point averages at the end of college, and made more money after college. The Bing preschoolers are now in their late thirties and forties, and correlations have emerged between type of delay (high or low) and success of long term goals, body mass index, and use of risky drugs. To get more accurate data than has been possible with self-report measures, Michel and his collaborators began bringing original Bing subjects to Stanford in 2014 for experiments using fMRI scanning to identify particular regions of the brain that allow for delayed gratification and anger control and to investigate, through genetic testing, hereditary characteristics that influence delay of gratification. Low and high delayers show different activity levels in various parts of their brains. Interestingly, the low delayers with lifelong low self-control on the Marshmallow Test did not have difficulty controlling their brains under most conditions of everyday life, but did show impulse control problems in their behavior and brain activity when faced with emotionally hot, tempting stimuli. 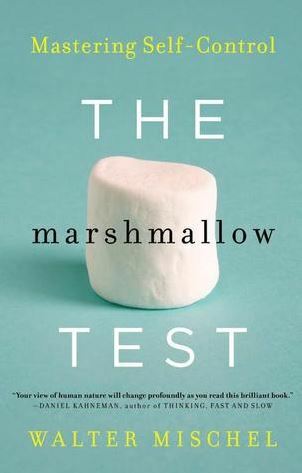 The theme examined in “The Marshmallow Test” can be summed up in the book’s subtitle: “Mastering Self-Control.” Mischel has demonstrated that the ability to delay gratification (or “delay ability”) is evident early in life, and can be measured. By analyzing how original Marshmallow Test subjects have navigated their teenage and adult lives, Mischel presents evidence that self-control in childhood is critical for a successful life: it predicts higher SAT scores, better social and cognitive functioning, a healthier lifestyle and a greater sense of self-worth. Self-control is crucial for the successful pursuit of long-term goals and essential for developing the self-restraint and empathy required for caring and mutually supportive relationships. According to Mischel, self control is the “master aptitude” underlying emotional intelligence, which contributes to a more fulfilling life, better stress management and coping skills. For decades, psychologists have focused on raw intelligence as the most important variable when it comes to predicting success in life. Mischel argues that intelligence is largely at the mercy of self-control: even the smartest kids still need to do their homework. “What we’re really measuring with the marshmallows isn’t will power or self-control,” Mischel says. Instead, the Marshmallow Test presents strategies kids use to make the situation work for them. How can they get that second marshmallow for themselves? What kind of thinking and action helps them get through experiences they have little control over? What enables them to delay gratification? “Hot” is the emotional part of the brain and it developed much earlier in human evolution than the cool system. The hot system’s reactions are reflexive and immediate: when angry, strike out; when tempted, go for it; when frightened, fight or run away. It gives us emotions from arousal and excitement to fear and panic. The hot system is automatic and doesn’t take future consequences into account — it makes us act fast without thinking and reflecting. It’s already active very early in development. The cool system, based in the prefrontal cortex, develops more slowly in the young child. It helps us resist temptation and take future consequences into account. While the hot system is reflexive, the cool system is reflective, allowing us to think creatively, use our imagination, work for long-term goals, learn effectively and solve problems. When the hot system is up and active, the cool system goes down. It’s a reciprocal relationship: as stress goes up, the hot system takes over, and when stress goes down, the cool system activates. To make self-control possible it’s important as a first step to reduce stress levels. Under high stress it’s difficult to “think cool” and to take delayed consequences into account. Mischel encourages young students to understand they can change how they think and plan, in ways that will allow them to have greater control over what they can do, learn, and what they can become. “When you grow up poor, you might not practice delay as much,” Mischel says. “And if you don’t practice then you’ll never figure out how to distract yourself. You won’t develop the best delay strategies, and those strategies won’t become second nature.” People learn how to use their mind just as they learn how to use a computer–through practice, trial and error. And mental representations, or how we think about and distract ourselves from tempting situations, can influence the ability to delay. Part memoir, part an engaging summary of self-control research, and part a self-help book with recommendations for increasing willpower, The Marshmallow Test explains how self-control can be mastered and applied to challenges in everyday life–from weight control to quitting smoking (Mischel recounts how he quit his own three-pack-a-day smoking habit), overcoming heartbreak, making major decisions, and planning for retirement. With profound implications for the choices we make in parenting, education, public policy and self-care, The Marshmallow Test will change the way you think about who we are and what we can become. Walter Mischel earned his PhD in Clinical Psychology from Ohio State University in 1956. He taught at the University of Colorado from 1956 to 1958, when he joined the faculty at Harvard University. He moved to the West Coast to work at Stanford University in 1962 and remained there until 1983, when he migrated back East to join the Psychology Department at Columbia University in New York, where he now serves as the Robert Johnston Niven Professor of Humane Letters. It was during his undergraduate studies at New York University that Walter became fascinated by psychoanalysis and new measures of personality, like the Rorschach test. “At the time, it seemed like a mental X-ray machine,” he says. “You could solve a person by showing them a picture.” But he noticed that academic theories had limited application, and he was struck by the futility of most personality science and meaningless testing. In a precursor to his later work with the marshmallow experiments, Walter took the young children from both ethnic groups and offered them a simple choice: they could have a miniature chocolate bar right away or, if they waited a few days, they could get a much bigger chocolate bar. His results failed to justify the stereotypes–other factors, such as who the children lived with, turned out to be much more important. But the experiment did get him interested in the question of delayed gratification. Why did some children wait and not others? What made waiting possible? Unlike the broad traits supposedly assessed by personality tests, self-control struck Walter as potentially measurable. In 1958, Walter became an assistant professor in the Department of Social Relations at Harvard. One of his first tasks was to develop a survey course on “personality assessment,” but he quickly concluded that, while prevailing theories held personality traits to be broadly consistent, the available data didn’t back up this assumption. Personality, at least as it was then conceived, couldn’t be reliably assessed at all. A few years later, he was hired as a consultant on a personality assessment initiated by the Peace Corps. Early Peace Corps volunteers had sparked several embarrassing international incidents, and the Kennedy Administration wanted a screening process to eliminate people unsuited for foreign assignments. Volunteers were tested for standard personality traits, and Walter compared the results with ratings of how well the volunteers performed in the field. He found no correlation; the time-consuming tests predicted nothing. At this point, Walter realized that the problem wasn’t the tests–it was their premise. Psychologists had spent decades searching for traits that exist independently of circumstance, but what if personality couldn’t be separated from context? “It went against the way we’d been thinking about personality since the four humors and the ancient Greeks,” he says. Most psychologists assumed that personality traits like aggression were stable, but Walter found that children’s responses depend on the details of the interaction. The same child might consistently lash out when teased by a peer, but readily submit to adult punishment. Another might react badly to a warning, but play well with his cohort. Walter wanted psychologists to analyze people’s responses under particular conditions. The challenge was devising tests that accurately simulated something relevant to the behavior being predicted. Traits like aggression were best assessed in terms of what he called “if-then patterns:” if a certain child was teased by a peer, then he would be aggressive. For decades, Walter has made significant contributions to the field of personality assessment in moving from a theory of “traits” to “interactionism:” developing assessments that reflect the interaction between cognitive patterns or overt behaviors operating in particular settings. While Walter was beginning to dismantle the methods of his field, the Harvard psychology department was in upheaval. In 1960, the personality psychologist Timothy Leary helped start the Harvard Psilocybin Project, which consisted mostly of self-experimentation. Walter remembers graduate students’ desks giving way to mattresses, and large packages from Ciba chemicals, in Switzerland, arriving in the mail. Mischel had nothing against hippies, but he held that modern psychology should be rigorous and empirical. And so, in 1962, Walter Mischel moved to Palo Alto and went to work at Stanford, where the now famous Bing Nursery School was established in 1966. Walter acts out his sentences and talks with a Brooklyn bluster–that’s where his family settled when they migrated from Vienna after the Annexation of Austria in 1938. Eight years old at the time, Walter remembers being teased in school by the Hitler Youth and watching as his father, crippled by childhood polio, was humiliated by being forced to limp through the streets–in his pajamas. A few weeks after the takeover, while the family was burning evidence of their Jewish ancestry in the fireplace, Walter found a long-forgotten certificate of U.S. citizenship issued to his maternal grandfather decades before, thus saving his family by enabling them to escape the gathering storm in Europe for a new life in New York City. During his spellbinding interview, at almost 85 years and having studied, taught, and traveled across America, Walter continued to work with students at Columbia University, living in his adopted “home town” of New York and summering in Paris. Expanding his research to schools in major U.S. cities, he continued his investigation in long-term effects of teaching self-control through providing “mental transformations” or cognitive strategies to delay gratification. He was also excited about using his fMRI data on neural circuitry to investigate whether some of these same teachable strategies might help retrain people diagnosed with certain mental disorders, like OCD and ADHD. An inspiring man, he died on September 12, 2018 at the age of 88. Best preparation for listening to Walter’s extraordinary interview? Watch this video first: Colbert Report: Walter Mischel versus Steven Colbert, Sept, 2014, The Colbert Report-Comedy Central, (Video, 5 mins) Here Walter, at 84½ holds his own against the lightning fast comic mind of Steven Colbert. During our interview he reveals that in 50 years of research with the marshmallow paradigm, no one has shown less impulse control or eaten the first marshmallow faster than Colbert. Lehrer, J. (May 18, 2009). Don’t! : The Secret of Self Control, The New Yorker. Inge-Marie, E., et al (2006). Predicting Cognitive Control From Preschool to Late Adolescence and Young Adulthood, Psychological Science. Pp. 478-484. Book Review of The Marshmallow Test, Wall Street Journal, September 19, 2014. To sidestep the paywall, go here and click on the top result. Konnikova, M. (10/9/14). The struggles of a psychologist studying self-control. The New Yorker.